This is a throwing masterclass exploring form and more particularly surface using slips, incising and other creative techniques. You will work on Leach kick wheels in the original throwing room of the Old Pottery. Cost: £100 to include all materials. In preparation for the morning’s throwing, you will take a brief look at clay preparation, including spiral wedging. 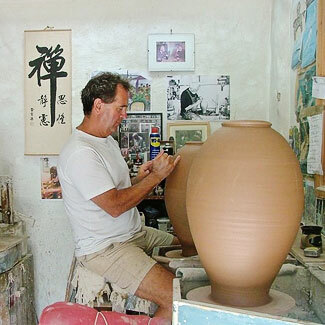 Adrian will then demonstrate three different surface decoration techniques on a thrown cylinder: the first will be use of a comb to create an incised decoration, the second will be use of dry ball clay on the cylinder surface, with the application of a slip trailer to ‘layer up’ the surface, and thirdly, the same approach using different coloured slips. Finally, Adrian will demonstrate large charger throwing and then encourage students to throw a medium size charger, or dish, to be decorated on the wheel using coloured slips.